Fran has been diagnosed with acute renal failure in the early months of the year. She is a spinster living alone in the city. She did not mind the physician’s instructions regarding her fluid intake, her diet, her level of activity, and her medications. As months passed, Fran started to notice that she is experiencing severe pain on her flank area. She cannot stand and move about for as long as she did in the past months. She tires easily and experiences shortness of breath. She went back to her physician and he told her that her ARF has already progressed to chronic renal failure (CRF) or end-stage renal disease (ESRD). When the patient has sustained enough kidney damage to require renal replacement therapy on a permanent basis, the patient has moved into the fifth or final stage of CKD, also referred to as chronic renal failure. Causes include chronic infections (glomerulonephritis, pyelonephritis), vascular diseases (hypertension, nephrosclerosis), obstructive processes (renal calculi), collagen diseases (systemic lupus), nephrotoxic agents (drugs, such as aminoglycosides), and endocrine diseases (diabetes, hyperparathyroidism). This syndrome is generally progressive and produces major changes in all body systems. The final stage of renal dysfunction, end-stage renal disease (ESRD), is demonstrated by a glomerular filtration rate (GFR) of 15%–20% of normal or less. Renal failure results when the kidneys cannot remove the body’s metabolic wastes or perform their regulatory functions. The substances normally eliminated in the urine accumulate in the body fluids as a result of impaired renal excretion, affecting endocrine and metabolic functions as well as fluid, electrolyte, and acid-base disturbances. Renal failure is a systemic disease and is a final common pathway of many different kidney and urinary tract diseases. Accumulation. As renal function declines, the end products of protein metabolism (normally excreted in urine) accumulate in the blood. Adverse effects. Uremia develops and adversely affects every system in the body. There are many diseases that cause chronic renal disease; each has its own pathophysiology. However, there are common mechanisms for disease progression. Pathologic features include fibrosis, loss of renal cells, and infiltration of renal tissue by monocytes and macrophages. Proteinuria, hypoxia, and extensive angiotensin II production all contribute to the pathophysiology. In an attempt to maintain GFR, the glomerular hyperfiltration; this results in endothelial injury. Proteinuria results from increased glomerular permeability and increased capillary pressure. Hypoxia also contributes to disease progression. Angiotensin II increases glomerular hypertension, which further damages the kidney. Because virtually every body system is affected in ESRD, patients exhibit a number of signs and symptoms. Peripheral neuropathy. Peripheral neuropathy, a disorder of the peripheral nervous system, is present in some patients. Severe pain. Patients complain of severe pain and discomfort. Restless leg syndrome. Restless leg syndrome and burning feet can occur in the early stage of uremic peripheral neuropathy. Hyperkalemia. Hyperkalemia due to decreased excretion, metabolic acidosis, catabolism, and excessive intake (diet, medications, fluids). Pericarditis. Pericarditis due to retention of uremic waste products and inadequate dialysis. Hypertension. Hypertension due to sodium and water retention and the malfunction of the renin-angiotensin-aldosterone system. Anemia. Anemia due to decreased erythropoietin production decreased RBC lifespan, bleeding in the GI tract from irritating toxins and ulcer formation, and blood loss during hemodialysis. Bone disease. Bone disease and metastatic and vascular calcifications due to retention of phosphorus, low serum calcium levels, abnormal vitamin D metabolism, and elevated aluminum levels. Glomerular filtration rate. GFR and creatinine clearance decrease while serum creatinine (more sensitive indicator of renal function) and BUN levels increase. Sodium and water retention. Some patients retain sodium and water, increasing the risk for edema, heart failure, and hypertension. Acidosis. Metabolic acidosis occurs in ESRD because the kidneys are unable to excrete increased loads of acid. Anemia. In ESRD, erythropoietin production decreases and profound anemia results, producing fatigue, angina, and shortness of breath. Volume: Usually less than 400 mL/24 hr (oliguria) or urine is absent (anuria). Color: Abnormally cloudy urine may be caused by pus, bacteria, fat, colloidal particles, phosphates, or urates. Dirty, brown sediment indicates presence of RBCs, hemoglobin, myoglobin, porphyrins. Specific gravity: Less than 1.015 (fixed at 1.010 reflects severe renal damage). Creatinine clearance: May be significantly decreased (less than 80 mL/min in early failure; less than 10 mL/min in ESRD). Sodium: More than 40 mEq/L because kidney is not able to reabsorb sodium. Protein: High-grade proteinuria (3–4+) strongly indicates glomerular damage when RBCs and casts are also present. BUN/Cr: Elevated, usually in proportion. Creatinine level of 12 mg/dL suggests ESRD. A BUN of >25 mg/dL is indicative of renal damage. CBC: Hb decreased because of anemia, usually less than 7–8 g/dL. RBCs: Life span decreased because of erythropoietin deficiency, and azotemia. ABGs: pH decreased. Metabolic acidosis (less than 7.2) occurs because of loss of renal ability to excrete hydrogen and ammonia or end products of protein catabolism. Bicarbonate and PCO2 Decreased. Serum sodium: May be low (if kidney “wastes sodium”) or normal (reflecting dilutional state of hypernatremia). Potassium: Elevated related to retention and cellular shifts (acidosis) or tissue release (RBC hemolysis). In ESRD, ECG changes may not occur until potassium is 6.5 mEq or higher. Potassium may also be decreased if patient is on potassium-wasting diuretics or when patient is receiving dialysis treatment. Proteins (especially albumin): Decreased serum level may reflect protein loss via urine, fluid shifts, decreased intake, or decreased synthesis because of lack of essential amino acids. Serum osmolality: Higher than 285 mOsm/kg; often equal to urine. KUB x-rays: Demonstrates size of kidneys/ureters/bladder and presence of obstruction (stones). Voiding cystourethrogram: Shows bladder size, reflux into ureters, retention. Renal biopsy: May be done endoscopically to examine tissue cells for histological diagnosis. Renal endoscopy, nephroscopy: Done to examine renal pelvis; flush out calculi, hematuria; and remove selected tumors. ECG: May be abnormal, reflecting electrolyte and acid-base imbalances. X-ray of feet, skull, spinal column, and hands: May reveal demineralization/calcifications resulting from electrolyte shifts associated with CRF. The goal of management is to maintain kidney function and homeostasis for as long as possible. Erythropoietin (Epogen) is used to treat anemia associated ESRD. Nutritional therapy. Dietary intervention includes careful regulation of protein intake, fluid intake to balance fluid losses, sodium intake to balance sodium losses, and some restriction of potassium. Dialysis. Dialysis is usually initiated if the patient cannot maintain a reasonable lifestyle with conservative treatment. 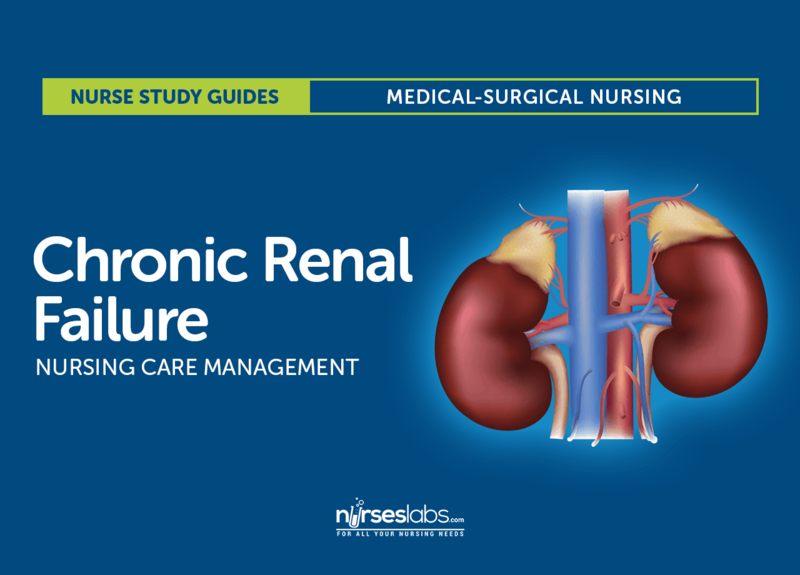 The patient with ESRD requires astute nursing care to avoid the complications of reduced renal function and the stresses and anxieties of dealing with a life-threatening illness. Assess fluid status (daily weight, intake and output, skin turgor, distention of neck veins, vital signs, and respiratory effort). Assess nutritional dietary patterns (diet history, food preference, and calorie counts). Assess nutritional status (weight changes, laboratory values). Assess understanding of cause of renal failure, its consequences and its treatment. Assess patient’s and family’s responses and reactions to illness and treatment. Assess for signs of hyperkalemia. Excess fluid volume related to decreased urine output, dietary excesses, and retention of sodium and water. Imbalanced nutrition less than body requirements related to anorexia, nausea, vomiting, dietary restrictions, and altered oral mucous membranes. Activity intolerance related to fatigue, anemia, retention of waste products, and dialysis procedure. Risk for situational low self-esteem related to dependency, role changes, changes in body image, and change in sexual function. Maintenance of ideal body weight without excess fluid. Maintenance of adequate nutritional intake. Participation in activity within tolerance. Support adjustment to lifestyle changes. Fluid status. Assess fluid status and identify potential sources of imbalance. Nutritional intake. Implement a dietary program to ensure proper nutritional intake within the limits of the treatment regimen. Independence. Promote positive feelings by encouraging increased self-care and greater independence. Protein. Promote intake of high-biologic –value protein foods: eggs, dairy products, meats. Medications. Alter schedule of medications so that they are not given immediately before meals. Rest. Encourage alternating activity with rest. Maintained ideal body weight without excess fluid. Participated in activity within tolerance. The nurse should promote home and self-care to increase the esteem of the patient. Vascular access care. The patient should be taught how to check the vascular access device for patency and appropriate precautions, such as avoiding venipuncture and blood pressure measurements on the arm with the access device. Problems to report. The patient and the family need to know what problems to report: nausea, vomiting, change in usual urine output, ammonia odor on breath, muscle weakness, diarrhea, abdominal cramps, clotted fistula or graft, and signs of infection. Follow-up. The importance of follow-up examinations and treatment is stressed to the patient and family because of changing physical status, renal function, and dialysis requirements. Home care referral. Referral for home care gives the nurse an opportunity to assess the patient’s environment and emotional status and the coping strategies used by the patient and family. Existing conditions contributing to and degree of fluid retention. B: Creatinine clearance is a major sensitive indicator of kidney disease. A: BUN level could also detect kidney disease but it is not as sensitive as creatinine clearance. C: Serum potassium level may indicate presence of kidney disease. D: Uric acid level may indicate presence of kidney disease. The presence of hypertension or diabetes. D: All of the answers listed above are relevant data to renal function. A: Voiding disorders are signs of impending or presence of kidney disease. B: The patient’s occupation could predispose him or her to kidney disease. C: The presence of hypertension or diabetes could predispose the patient to kidney disease. Decreased levels of erythropoietin, a substance normally secreted by the kidneys, leads to which serious complication of chronic renal failure? A: Anemia due to decreased erythropoietin production could occur in patients with chronic renal failure. B: Metabolic acidosis occurs in ESRD because the kidneys are unable to excrete increased loads of acid. C: Hyperkalemia occurs due to decreased excretion, metabolic acidosis, catabolism, and excessive intake (diet, medications, fluids). D: Pericarditis occurs due to retention of uremic waste products and inadequate dialysis. D: All of those mentioned above should be restricted in patients with chronic renal failure. A: Fluid should be restricted because the patient may result to excess fluid volume. B: Protein is restricted because its end products may accumulate in the blood stream. C: Sodium and potassium is restricted because they can aggravate the disease. D: The abovementioned laboratory results occur in patients with decreased GFR. A: Increased pH occurs due to decreased GFR. B: Decreased creatinine clearance occurs due to decreased GFR. C: Increased BUN occurs due to decreased GFR. C. The presence of hypertension or diabetes. 3. Decreased levels of erythropoietin, a substance normally secreted by the kidneys, leads to which serious complication of chronic renal failure? 1. Answer: B. Creatinine clearance level. B: Creatinine clearance is a major sensitive indicator of kidney disease. A: BUN level could also detect kidney disease but it is not as sensitive as creatinine clearance. C: Serum potassium level may indicate presence of kidney disease. D: Uric acid level may indicate presence of kidney disease. D: All of the answers listed above are relevant data to renal function. A: Voiding disorders are signs of impending or presence of kidney disease. B: The patient’s occupation could predispose him or her to kidney disease. C: The presence of hypertension or diabetes could predispose the patient to kidney disease. A: Anemia due to decreased erythropoietin production could occur in patients with chronic renal failure. B: Metabolic acidosis occurs in ESRD because the kidneys are unable to excrete increased loads of acid. C: Hyperkalemia occurs due to decreased excretion, metabolic acidosis, catabolism, and excessive intake (diet, medications, fluids). D: Pericarditis occurs due to retention of uremic waste products and inadequate dialysis. D: All of those mentioned above should be restricted in patients with chronic renal failure. A: Fluid should be restricted because the patient may result to excess fluid volume. B: Protein is restricted because its end products may accumulate in the blood stream. C: Sodium and potassium is restricted because they can aggravate the disease. D: The abovementioned laboratory results occur in patients with decreased GFR. A: Increased pH occurs due to decreased GFR. B: Decreased creatinine clearance occurs due to decreased GFR. C: Increased BUN occurs due to decreased GFR.